Rocky trails and holes are pretty much where the Kenevo is at home. The 180mm of travel turns this into a smooth trail. The Kenevo is the second distinct major off-road e-bike from Specialized following the runaway success of their Turbo Levo. For 2018 Specialized has raised the bar with its latest full-suspension offering. 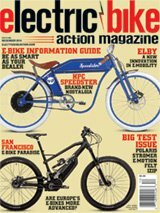 By going for a longer-travel option, the designers have made big-mountain descending and riding an option for e-bikers. The 180mm of front- and rear-wheel travel is a lot, especially with the Butcher plus-size tires. Add in an Öhlins coil-spring rear shock and you are basically looking at a rock eater that will be happy to take some abuse. Despite the similarity in appearance to their non-assist Enduro platform, the actual ability of the bike is probably even greater due mainly to the extra travel and the weight, which lends more stability to the ride. The Kenevo up close in descend mode. The saddle is a key feature of the layout. Specialized offers only one version of the aluminum Turbo Kenevo, and it is fully tuned and ready to rumble out of the box. SRAM Code R brakes provide significant stopping power thanks to the massive 200mm rotors. The drivetrain is a standard 1×11 GX setup with one click shifting, thus reducing wear rates under power on the rear-drive system, as the rider can only shift one step at a time. The Brose S motor is svelte and well protected. The wheels and tires are a very solid package. The Butcher Grid 2.8-inch tires are market-leading in performance, and they are something that has been missing on many e-bikes previously. We would suggest going tubeless as soon as you pick up the bike, as experience tells us that on rough ground with a heavy bike you will be coming home with less flats, especially if you like running low pressures. Thanks to the 38mm-internal-width Roval rims mated to DT Swiss spokes and plus-size tires, the wheel package is well supported and keeps their form whatever the rider chooses to do when pushing hard in corners. Finally, the suspension is probably the most ideal system that one could choose for a gravity-oriented bike. The coil-spring Ohlins rear shock gives the rider the ability to finely tune the performance and keep it constant even on long descents, while the charger-cartridge-equipped RockShox Lyrik RCT3 fork is robust and smooth enough to take big hits. Considering the one-model option, we think that Specialized was correct to build the bike right the first time and avoid consumer confusion. Simply put, there is nothing missing here, and the whole bike has been built to handle big terrain. One-click shifting with SRAM’s GX is reliable and solid. It’s no secret that the first incarnation of the Brose motor two years ago was not the strongest to be found. However, further, well-funded research and development from Specialized in partnership with Brose has led to better heat management, stronger magnets, better current efficiencies and better use of the power that is available from the completely custom and fully integrated Specialized 504-Wh battery. Specialized also now ships the bike with a bar-mounted wireless remote as standard, although they maintain their preference of not having a distracting bar display; instead, battery levels are indicated on the battery itself. Specialized has taken a very tunable view with e-bikes since day one. Their app offers riders the ability to tune motor response and power characteristics in each of the three power modes. We didn’t ride the Kenevo with the app active this time, as we didn’t feel the need to; the bike is good to go it alone. We like the app, but prefer to keep our rides to ourselves—just us and the trail. The standard tune is absolutely right for what this bike has been designed for. Updates are sometimes pushed out of Specialized, but if you spurn being connected, you are not going to really notice not being permanently connected to the bike when you ride. It is good to know, though, that there is the possibility to tune if you desire. Coil-sprung goodness from Ohlins is hard to beat. With its $7000 price tag, the Specialized is intended for expert riders who love to bomb down hills, then more easily get themselves back up for another run sans shuttle. It’s much more bike than a less-seasoned rider would need. That said, it’s a confidence-inspiring bike for any rider. Owing to Specialized’s years of R&D via the Levo platform, as well as their mountain bike design legacy, the Kenevo sets itself apart from most of the e-MTBs out there. The Turbo Kenevo is about riding downhill, but its trail-friendly geometry and inclusion of the magical Wu seatpost give riders the option to pedal if they want. However, if you do like trail riding, the extra weight is somewhat going to be a disadvantage, and opting for the Turbo Levo would be the best option. The Kenevo is like any enduro bike—it is designed to get you to the top of the trail quickly and with some comfort. The suspension is permanently active, which means grip is always top quality, and the motor response is precise and silent when you hit the gas. Cornering is as you would expect from an enduro-style bike. It works but is not going to win an XC prize, and the head angle is relaxed, which is a word we would use to describe its uphill-handling traits. Still, the riding position is a good compromise, and it does not wander when blasting along. We like the idea that with the Kenevo it is about taking the most direct route to the top. The Kenevo is about going fast—yes, it’s an e-bike that is limited in speed, but once you pedal or drift past the 20-mph assist limit, you are going to be in for a surprise. No matter what we threw at the Kenevo on the trail, it basically just smoothly passed it by. Rocky, rough descents with holes and awkward drops are no problem. Long, loose corners that would normally give us the element of fear on a lighter bike were now fun to engage. Traction is immense; the Butcher Grid tires are so good that even when we dropped the pressure really low, they supported us no matter what we did. SRAM provides Specialized with this one-shift-per-click shifter to avoid over-stressing the shift system. Cornering on tighter berms and in more technical sections is interesting due to the downhill capacity; you are essentially encouraged to take a shorter line. The coil-spring rear end is constantly active whatever you throw at it, which is very reassuring. We didn’t have to tune it much; we set a slower rebound when riding jump lines to make sure we were not bucked out of the saddle. Apart from that, it was super sensitive to bumps and was keeping the rear wheel planted. The head angle in combination with the Wu dropper post gives the feeling that this is the only way to ride a bike. We are surprised more seatpost-makers have not done this drop-angle feature. It basically changes the bike significantly, as the possibility to move around and not get hung up on the saddle is a huge advantage over other setups we have used. Did we find any weaknesses? Specialized has taken the proven Turbo Levo platform that has sold in ridiculous numbers and adapted it to the gravity set. During all our time on the Kenevo, we can’t really say we found a real weakness. Maybe it gives less skilled riders the feeling of being able to ride it all, and thus they might find themselves out of their depth sometimes, but can we call that a weakness? SWAT system with nifty tool storage. And out pops the Allen-key tool! The Turbo Kenevo has monster-trucking qualities that put it at the top of our list when it comes to gravity e-bikes currently on the market. It’s very stable, will blast through anything, looks good, is solidly built and needs no tuning to make it gravity-ready. The ability to say goodbye to the shuttle forever is one of the reasons we like e-bikes so much. With this, you might even say goodbye to the ski lift in bike parks. There is nothing that makes us think that the Kenevo needs improvement; it is that good. Well, yes, the weight is higher than a normal gravity bike. In this case, though, we think the weight helps the bike’s stability rather than works against it. Whatever the feeling that you might be looking for from a long-travel e-bike, we think the Kenevo is going to help you find your gravity Zen again. It’s almost like riding a DH bike, but it’s an e-bike and is nicer riding uphill than a DH bike. The price for what you get is really good, robust and good-looking. The Kenevo gives the rider plenty of room to find balance on the bike no matter which way the trail is heading. Frame: Multi-formed, aluminum alloy, 6061 T6, dual suspension, four-link all-mountain design/130mm travel.